Over the years, people have worked out that when wandering around outside in the dark, a bright white light is worst possible option if you want to actually see anything. Flashlights and headlamps only illuminate small patches of ground, and in doing so, prevent your eyes from adjusting to the dark. Wearing a lamp, you become trapped in a tiny circle of light, with nothing but empty blackness beyond. Allowing your eyes to do their job, a vast expanse of ice, sky, stars and auroras opens up all around you. Of course, there are limits to what an eye can do. Traveling by foot, there is no doubt that unaided is the best option. However, if you ever need to read something, perform fine work, or operate one of the many tracked vehicles ferrying equipment and personnel between far-flung buildings, some form of light is essential. 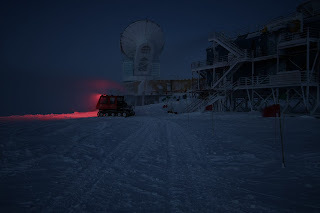 As a compromise, any light for use outside - be it a hand held flashlight, a beacon on a distant lab, or a headlight on the heavy machinery - has been covered with red filters. (Red light has a significantly less detrimental effect on night vision than does white.) The result of this careful light management is that the darkness outside is generally preserved, and unaided visibility remains good. 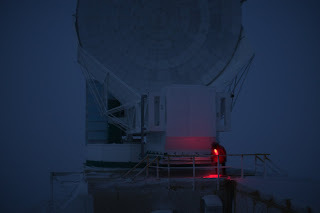 The only colors to be seen on a clear night are the purplish-blue of snow and ice in the starlight, the green, yellow and red curtains of auroras across the sky, and points of red light going about their business behind the station. hmm ... slightly different then the Red Lights of Amsterdam ... oh well!